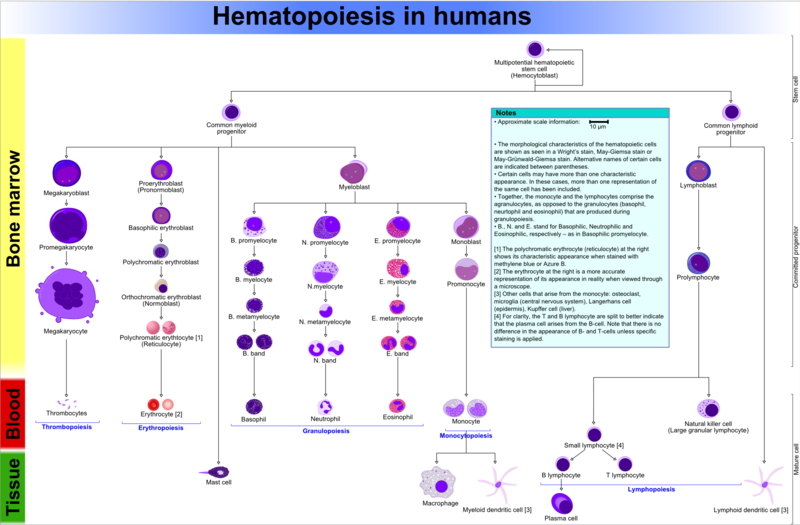 Haematopoiesis is the process by which blood cells are generated. After birth it occurs only in the bone marrow but in the fetus the liver, spleen and lymph nodes also contribute to the process. The bone marrow is responsible for the generation of four different types of blood cells. 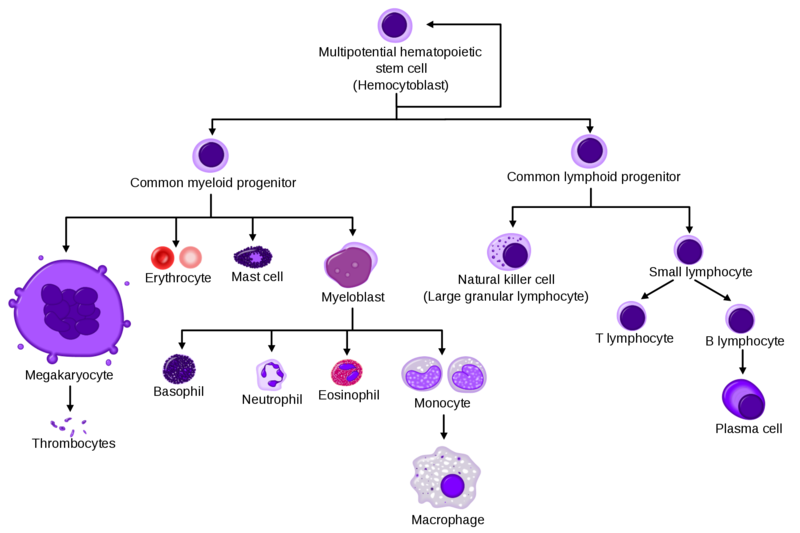 The basic divisions of haematopoiesis. The development of the lymphocytes also involves the lymph nodes and thymus, the former primarily for B cells and the latter for T cells. Lymphopoiesis is typically not readily apparent in bone marrow samples and the assessment of a bone marrow specimens tends to refer to the trilinear haematopoiesis of red cells, granulocytes/monocytes and platelets. 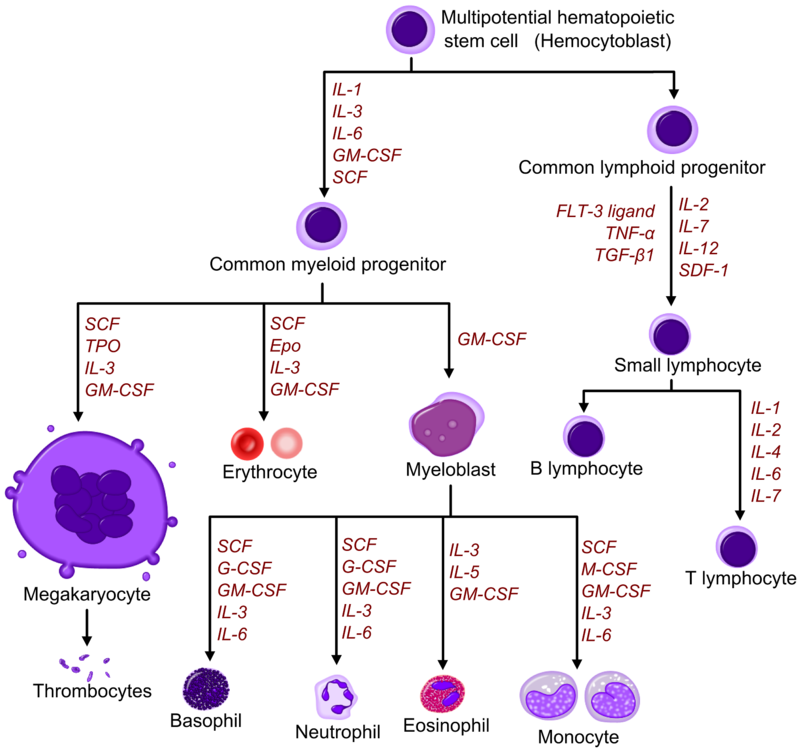 The process of haematopoiesis is dependent on pluripotent stem cells. These cells have the ability to differentiate into any of the cells made by the bone marrow and are able to maintain their own numbers by dividing into more stem cells. When a stem cell starts to differentiate the number of possible cells it can become begins to reduce. For example, a stem cell may reach the stage where it can only become a granulocyte or monocyte and has lost the ability to mature into a megakaryocyte, red cell or lymphocyte. Further differentiation narrows the possibilities down further until the cell is committed to a single specific destination. There has been a suggestion that the traditional pathways of haematopoiesis, in which the first split is into lymphocytes and non-lymphocytes may not be accurate and that the first branch is instead into cells which can become either red cells/granulocytes/macrophages/megakaryocytes or lymphocytes/granulocytes/macrophages/megakaryocytes. The regulation of haematopoiesis is under the control of various hormones, growth factors and cytokines which alter haematopoiesis to the body's needs. For example, the response to a bacterial infection will include the generation of cytokines which stimulate the production of neutrophils. Haematopoiesis is a highly active process and creates in the region of 10,000,000,000 to 100,000,000,000 cells per day. 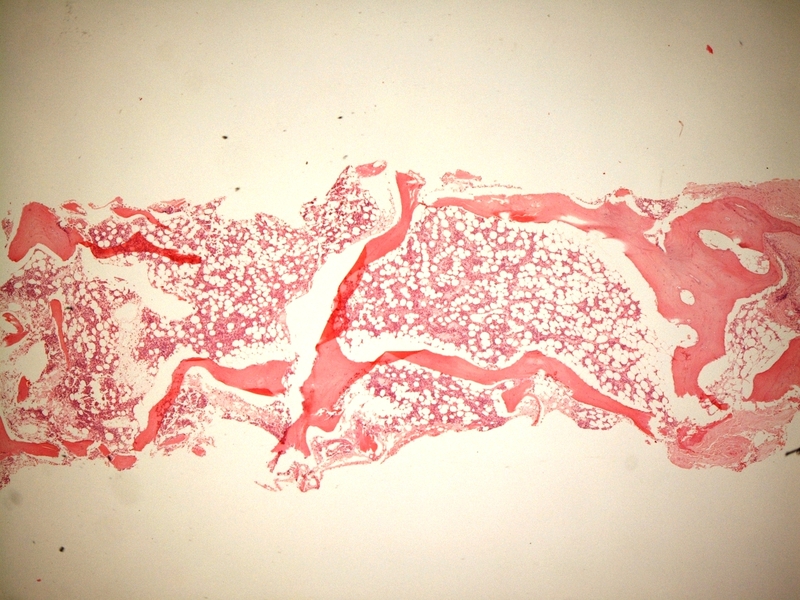 The bone marrow resides in the medullary cavity between the intertrabecular spaces in the centre of the bones. The bone marrow is composed of haematopoietic elements (red marrow) and mature adipose tissue with stromal cells (yellow marrow). The proportion of bone marrow that is haematopoietic is sometimes referred to as the cellularity. The cellularity falls with age; at birth it is around 100%. As a general rule of thumb, the cellularity and the patient's age should equal one hundred. However, this rule does not address the wide spread of the normal range of the bone marrow cellularity for much of adult life and should be supplemented by the observation that from the age of about 20 to 70 years the bone marrow cellularity is normal if it is between 30% and 70%. Once the cellularity starts to drop after early childhood the haematopoietic bone marrow tends to be found only in the bones of the axial skeleton (skull, vertebrae, ribs, pelvis) and the ends of the humerus and femur. The reference ranges for cellularity tend to be derived from samples obtained from the pelvis. 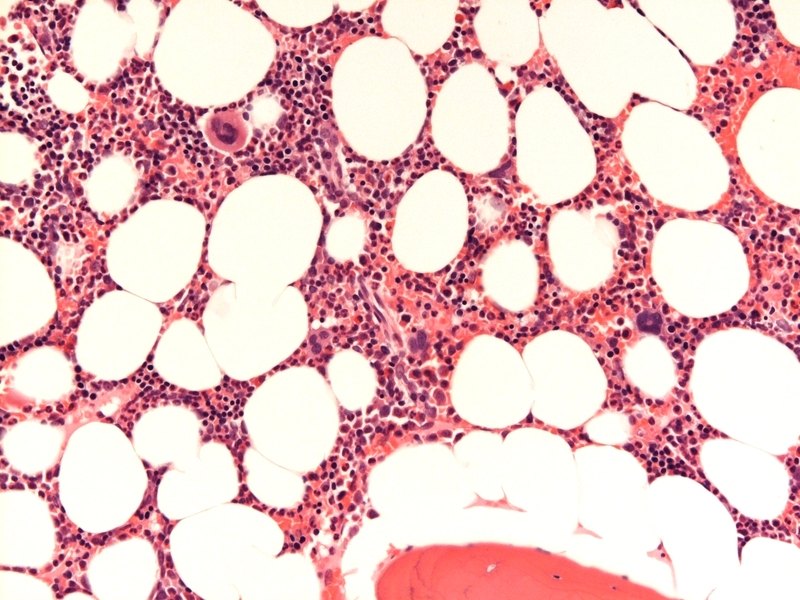 The architecture of the bone marrow is reflects the organisation of the trilinear haematopoiesis. The myeloid (granulocyte and monocyte) precursors are situated next to the bone trabeculae (paratrabecular position) and mature towards the intertrabecular region. The erythroid components and megakaryocytes are located in the intertrabecular zone. The megakaroyctes tend to be found next to blood vessels. The erythroid elements are gathered into islands. In a normal bone marrow there should be haematopoietic cells at all stages of differentiation. The bone marrow also features mesenchymal stem cells.